How to Make Ketchup Soft Goat Empal Delicious .If the last discussion we present the jerked beef recipes, this time we will also share recipes with the main ingredient jerked mutton. 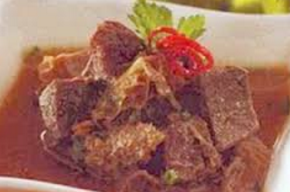 In this special day we will share the recipe in making soy sauce jerked goat soft and delicious. The feast of Eid al-Adha is a great day Muslims who fall padal 10 Dhuzlhijjah. The feast of Eid al-Adha which is often called the Hajj or feast in which Muslims set aside his wealth to sacrifice. Apasajakah that sacrificed ,,?. can cow or goat definitely not allowed animals are prohibited to be made ​​a sacrifice. Therefore, this time we will discuss Prescription Empal Leza Soft Goat Ketchup t. So, for those of you who got the meat can be made ​​into a delicious meal. In the process of making soy sauce jerked goat is very easy. However, to produce a delicious taste that our PR. And should, do so according to the step by step sequence. Ok, we just prepare the ingredients and seasoning is needed to make it. The following recipe makes dala ..
First, enter the mutton along with the bay leaves, ginger and water to taste to the pan. Boil until half cooked. After that, pick up the lamb and put it into a container. Then cut up small. Furthermore, at all the pieces of mutton bruising. Next stir-fry seasoning bay leaves, lime leaves and spice puree until fragrant scent. Enter pseudo mutton pieces that have been crushed. Stir and process until blended. After that, enter the coriander and soy sauce. Stir until evenly distributed. Lastly, take coconut milk and pour into the batter. Cook until completely cooked and the flavors mingle in the goat meat. If so, remove and insert it into the container. Done, jerked goat prepared in soy sauce serve. 0 Komentar Untuk "How to Make Ketchup Soft Goat Empal Delicious"